A charming, imaginative, and traditional Italian tale, which teaches children about the richness of the Italian heritage, culture and values while providing the option to hear the story in the Italian or English language. Nino and the magic gifts is based on a folktale, passed down through generations - now available for International enjoyment. This charming tale offers clear and concise Italian and English spoken narrative with the ability to highlight words to increase comprehension – reinforced by colourful and imaginative animations. 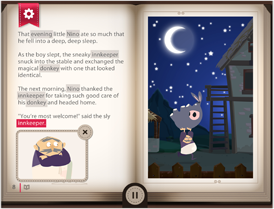 The diverse features of this app help to create an enriching and memorable reading experience - for guided reading, and with the potential to be explored by your children independently. Continue your child’s educational journey with ‘Nino and the wizard’, the sequel to Nino’s first adventure with his friend the Ogre. Cappuccino apps come straight from the heart of Italy - created by Italian people to translate Italian history and introduce children around the world to the richness of Italian folktales and culture. educate but entertain, facilitating learning through storytelling and beautiful illustrations.